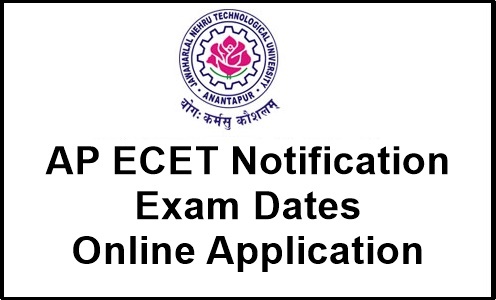 AP ECET 2019 Notification, Online Application Form, Exam Dates: Andhra Pradesh Engineering Common Entrance Test 2019 Notification has released by JNTUA, Ananthapuramu at sche.ap.gov.in. Date of AP ECET Examination is 30th April 2019. POSTPONEMENT OF APECET 2019: The APECET 2019 Examination scheduled on 19.04.2019 (Friday) from 10.00 am to 1.00 pm is postponed to 30.04.2019 (Tuesday) from 10.00 am to 1.00 pm due to overlapping of certain final year Diploma Examinations. A Common Entrance Test designated in full as Andhra Pradesh Engineering Common Entrance Test for Diploma Holders and for B.Sc. (Mathematics) Degree Holders and in short as AP ECET 2019 will be conducted by JNT University Anantapur on behalf of the Andhra Pradesh State Council of Higher Education for the academic year 2019-2020 in accordance with G.O.Ms.No:24 Education (EC) Department dated:18.03.2004, G.O.Ms.No:25, dated:28.06.2006 and G.O.Ms.No:19, dated: 02.02.2008 For Diploma Holders and G.O.Ms.No.57 (EC2) dated:12.05.2008 & G.O.Ms.No58 (EC2) dated:12.05.2008 for B.Sc. (Mathematics) degree holders. A.P Common Entrance Test (APECET-2019) will be conducted on 19-04-2019 from 10 AM to 1 PM for admission into 2nd year level lateral entry into Engineering/Pharmacy courses for Diploma holders of engineering & Technology and B.Sc. Candidates for the academic year 2019-20. Eligible candidates an submit their applications through online mode only, by paying the application registration and processing fee of Rs 550/- through AP online payment gateway (credit card / Debit card and net banking). The Detailed information regarding eligibility, syllabus and model question paper, mock test, related instructions and procedure for online submission of applications are available on the website www.sche.ap.gov.in/ecet. (i) For lateral admission into 2nd year regular B.E. and B.Tech Courses in All India Council for Technical Education approved Un-Aided Private Professional institutions (Minority & non-Minority) and University Engineering Colleges for the seats specifically earmarked for Diploma holders and B.Sc degree holders for the academic year 2019-20. (ii) For lateral admission into 2nd year regular B.Pharmacy Courses in Un-Aided Private Professional institutions (Minority & non-Minority) and University Pharmacy Colleges approved by Pharmacy Council of India for the seats specifically earmarked for Diploma holders and B.Sc degree holders for the academic year 2019-20. NOTE : Diploma holders of Petroleum Engineering / Technology are eligible to apply for Chemical Engineering. NOTE : Diploma holders of Refrigeration & Air Conditioning are eligible to apply for Mechanical Engineering. Andhra Pradesh Engineering Common Entrance Test 2019 will be conducted through Computer based test by JNTUA, Ananthapuramu on behalf of Andhra Pradesh State Council of Higher Education (APSCHE), in accordance with G.O. Ms No.57 HE(EC.2) dt:12.05.2008 and G.O.Ms No.43 dt:25.05.2011 for Diploma Holders of Engineering Technology/ Pharmacy and B.Sc. Graduates (with Mathematics) for admission through lateral entry at 2nd year level into B.E./ B.Tech./ B.Pharmacy Programmes offered in Universities and AICTE/PCI approved Institutions in A.P. for the academic year 2019-20. The eligible candidates have to apply through online mode only. The detailed information regarding eligibility, syllabi, fee and other instructions is available in the website sche.ap.gov.in. For registration and submission of online application the aspiring candidates have to visit the web site www.sche.ap.gov.in/ecet. The qualifying percentage marks for obtaining a rank in APECET -2019 is 25% of the aggregate marks in the four subjects (three subjects for B.Sc. Mathematics) i.e., 50 marks out of a total of 200. However, in the case of SC/ST candidates, there shall be no minimum qualifying marks for ranking the candidates. The rank obtained with the benefit of relaxation of the minimum qualifying marks at the APECET [FDH & B.Sc. (with Mathematics as one of the optional subjects)]-2019 by any candidate claiming to belong to SC/ST category will be cancelled in case the claim is found to be invalid at the time of admission. Sir pls postpone ecet ,our examinations are upto march 25 .Pls understand our students problem .Try to extend the ecet date ,we have no enough time for preparation pls sirrrrrr. sir I have got 761 rank in in ecet2017of mechanical engineering. In which college can i get seat? How to edit AP ecet 2017 online application form?? Correction dates ?? When.